Big Blue Marble hosts story time every Wednesday at 10 am. We also host special events on some Saturdays - check our calendar. 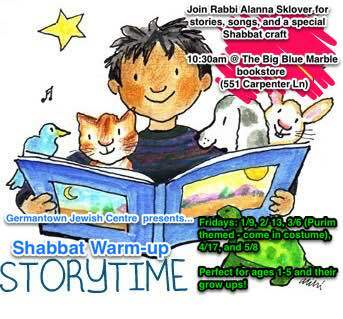 In partnership with Germantown Jewish Centre and JKidPhilly, Big Blue Marble hosts a monthly pre-shabbat story time, featuring books, songs, and crafts. Some months are focused on Jewish holidays. All are welcome!